Why should I do team building? Team building games build community and trust; nurture leadership; instill company values; and effectively educate employees. When is the right time to do team building? In times of change or uncertainty (downsizing, outsourcing, consolidation, combining departments). To celebrate a recent success to build on your momentum. Following a failure to turn it into a valuable learning experience to regain momentum. How does the idea of fun and games really work? Elements of game theory are used to create innovative ways for employees to think about their job, to be creative, and take more initiative. Why do people participate in team building? For some, it’s about a challenge, puzzle, or perhaps a quest to conquer. For others, it’s about relaxing and blowing off steam in a casual, yet engaging way. Some participants simply want to experience the fun. And then there are those who simply want to interact and be social. 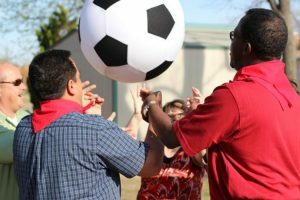 We custom design our team building activities to appeal to everyone, and to accomplish your purpose for the play through a variety of ways. Is it possible to have fun at work? YES! ‘Fun at Work’ is about the intentional integration of specific mechanics, processes, experiences and solving big problems in new, engaging and creative ways. What makes your team building events so good as well as so different from other team building companies? Most companies focus on cheesy fun like a bouncing castle, an egg toss, or a rope course. There’s no purpose to the play at all. Our approach, pioneered by Matt Martindale, Fun for Business’ CEO (Chief Entertainment Office), is different by design. We understand that you can’t ‘force’ someone to have fun. Seems obvious, doesn’t it? However, when activities are voluntary, intriguing, and creatively engaging, wonderful things occur. There is less pressure and frankly, more buy-in. Our play has a purpose. Participants make choices with varying degrees of risk, reward, and challenge. To enhance the experience, we provide opportunities for participants to follow, suspend, or even sometimes change the rules in real time — just like in the real world! It works … very well! We provide vivid, memorable experiences that our participants WANT to engage in. This fusion of art and science sparks creativity and unity that it is wildly entertaining. How much experience do you have at team building? Matt Martindale, Fun for Business CEO, has been leading the corporate thought revolution in corporate entertainment for over twenty five years. He’s personally performed (or spoken) in front of an estimated 300,000 people at more than 2000 events since 1989 all across the U.S.
How do you design your team building games? It’s guarded in a secret vault by an elite Seal team and real life ninjas. Okay, maybe we’ve slightly exaggerated that, but we do continually research, subscribe to, and follow the latest in game design theory, then add in a heavy dose of psychology, and behavioral economics. What makes Fun for Business different? We promote a behavior that aligns with the defined topic of a specific retreat or seminar. What types of events do you do team building for? What groups or organizations do you do team building for?